Monet and his family moved outside of Paris, to Giverny, in 1883. Here he would paint many of the works that would define him as a pioneer of art, and one of the most influential artists of all time. 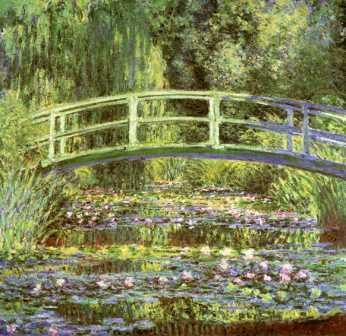 In 1889 Monet painted a bridge that went over the pond in his garden. Like other series of paintings, such as Haystacks and Parliament, done by Monet, he revisited the subject many times. Throughout 1889 and 1890, Monet painted several canvases depicting the bridge and its surroundings. In each painting in the Japanese Footbridge series, a bridge is the focus of the composition. In most of these paintings, the bridge spans the entire width of the picture dividing the canvas in half. The color of the bridge varies in each depiction depending on the light in which it was painted. It is always an arched wooden bridge with a handrail mirroring the arched horizontal of the walking planks held up by a few vertical supports. In some, the bridge appears dark showing the color of the dark wood in the shadows of the surrounding willow trees or under the shade of a passing cloud. In others, it is a vivid blue, purple, or pink reflecting the light in the atmosphere bouncing off the flowers along the banks of the pond. The top half of the painting shows what is behind the bridge, away from the viewer. The top is dominated by the leaning branches and leaves of the willow trees. It is almost entirely made up of shades of green occasionally with some blue or yellow. On the bottom of the paintings Monet shows his pond. Later in his life the Water Lilies would become among his most well-known paintings. Like the bridge, the color of the water, lilies, and other flowers change. In some they are a deep red or orange. In others they are a vibrant green, soft blue, or highlighted with pinks. Like Monet’s other series of paintings, the subject matter, in this case the actual bridge, is not what makes these the important works that they are. Monet did something very new at Giverny. Instead of painting the beauty of nature as it is, he made nature into what he wanted and then painted it. His paintings of his gardens, including the Japanese Footbridge, are paintings showing how he sculpted nature. Monet meticulously cultivated the garden to his specifications. He brought in a craftsman to construct the bridge, traded plants to get the best rare varieties he could find, and diverted a stream to supply his pond with water. His garden at Giverny would provide the inspiration for what would become his biggest influence on the art world.